Austin’s is right across the road from Hyatt High Sierra Hotel. Austin’s has one of the best french fries in Lake Tahoe. They have a batter for the fries and the taste is really good. Along with the fries, they have a jalapeño dipping sauce that is amazing. They are not really famous for a main dish, but they are really known for their appetizers like the fries and fried green tomatoes. My meal that I got was cubed steak. It was really good and tasted homemade. The food is warm and yummy. The cubed steak had a homemade gravy on it. The meal that I had was served with mashed potatoes, and we got french fries on the side. Everything is served with cornbread. The cornbread is super – with a sweet honey taste. The view is okay; it is of trees and of the road. Austin’s is near the lake, but is not right on it. Austin’s has really good food at a really good prices, and the food is like a home cooked meal. I recommend going to it if you are in the area and you can get there easily. It is great for the whole family. Austin’s is right across the road from the Hyatt hotel in Lake Tahoe. The best thing to get there are their french fries. They have a really good batter on them that makes them taste really good. The aren’t really famous for any main dishes, but they do have really good chicken tenders. It is the same batter as on the french fries. You can pick a side dish. They have everything between fries to green beans. The fries also come with a jalapeno dip that is not too spicy but very good. It is normally not packed so you don’t have to make reservations. It is small and only seats a few people. It is not a fancy restaurant and you won’t need to dress up to go there. That is one place that is good to eat at in Lake Tahoe. The Waffle House is a fast food breakfast restaurant. They are open 24hours a day. The best thing to get is the All-Star breakfast. They serve lunch and dinner, but are mostly known for their breakfasts which are served all day. The All-Star breakfast is a meal with eggs – your choice scrambled or sunny side up, you can get toast or a biscuit, hash browns or grits, sausage, ham or bacon, and a waffle or biscuits and gravy. I always order the sausage. It has a lot of flavor and is juicy. Everything is made to order, so it is always hot and fresh. They use lots of real butter on their griddle. So, even though it is fattening it is tastey. Inside they have a bar-like counter top, a bunch of booths, and some tables. The one thing they are known for is their waffles. The waffles have a crispy outside and a soft inside. My brother and sister and I always sit at the counter-top. We like to watch the cooks make the meals. It is cool to see how they cook everything on the griddle. They have to work fast to get everything made. That is the reason we love to go to the Waffle House. The Waffle House is good. You should go there. They make waffles that say “Waffle House” in the middle of them. They are good to eat because they taste like a pancake batter cooked on a griddle. I ordered the All-Star breakfast. It comes with practically everything you would ever want for breakfast. It came with eggs. I ordered sunny side up. They are also dippy eggs, but I don’t dip my toast in them. I also had hashbrowns. They are good. My brother likes to put mustard on his, I only put salt on mine. Two sausage patties come with the breakfast. They are good because they are tender and good. They are not spicy. Finally, I got two pieces of toast. I put strawberry jelly on my toast and eat it. It is a really good place to eat. It is my mom’s favorite and my favorite breakfast restaurant. We had the opportunity to take the Big Tree Tram Tour through Mariposa Grove in Yosemite National Park. The Giant Sequoia trees are some of the largest trees I have ever laid eyes on. They are in with the rest of the many tall trees at Yosemite. They are the tallest and the widest at Yosemite National Park. The tram ride taakes you through most of the Sequoia trees they have at Yosemite. The tram ride talks all about the history behind the trees and the ones who saved the trees from getting chopped down. It also shows you all the unique trees they had there. Some of the trees that are unique are like the clothespin tree; it looks like a clothespin from the many wild fires they have had there. My favorite tree is the Giant Grizzly. It is one of the largest Sequoia trees, with one limb or branch that is seven feet wide. The other one that is my favorite is one with a hole so big that a pickup truck can drive through it. It cost $26.50 for an adult, $25.00 for seniors, Child $19.00, and children under five are free. I recommend going on the ride instead of walking the few miles to see the entire grove. In Yosemite there are big trees called sequoias. They are so big one is 31 feet wide. The tour we did is the only one you can do in that area. It is called the big tree tram tour. On the tour there is a free audio tour that you can listen to. There are 2 stops they make one is near the end and the other is closer to the back of the trail. The first stop is at a small museum. The museum has samples of the pine cones and seeds. You cannot take any of them with you from the park. The second stop is to see the Great Grizzly tree and one of the trees that you can walk completely through. All of the trees they have there are unique — one has been growing for over 4,000 years. One of the other trees is able to have a bug car that can go threw it, but they won’t let you try. That is one of the reason we went to see Yosemite to see these amazing trees. One of the main things to see at Wilbur’s birthplace is the Wright house. 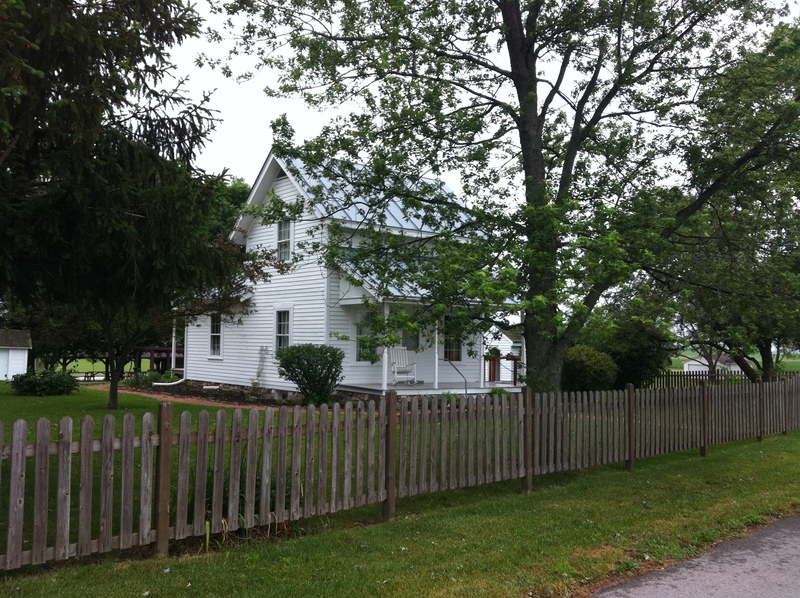 The Wright house was built-in the 1860’s. The house was one of my favorite parts. There was an upstairs and downstairs. Their oven heated their whole house. Their restroom was outside (an outhouse), and at night you have to use chamber pots as your toilet. I personally think that it would start to smell bad at night. The bad part is if you were a kid you had to take the chamber pot out and clean it. The house is just one of the many things to look at there. My other favorite part was the museum it had a miniature street in it. It is from 1900. It had the Wright’s bike shop, a barber shop, a general store, and it even had a small shopping center for clothes. My favorite thing about the museum was the miniature version of the Wright brother’s Kitty Hawk camp. It had all the stuff they would have brought with them from Indiana to North Carolina. They also had a replica of the Wright glider next to the camp. Finally, there is even a video you can watch in the museum. Visiting the Wilbur Wright Birthplace only costs $2.oo to get in. They have a visitor’s center where you can buy collectibles, books, and they also sell small-scale replicas. This is an attraction worth going to see. We went into the gift shop and paid to go take a tour. It was a long tour (1 hour and 30 minutes). First we got to see Wilbur Wright’s memorial. Then we saw his house. I liked seeing the toys he and his brothers played with – like a bow and arrow, rocking horse, and building blocks. I liked seeing the baby’s dress in the cradle. Then we went to the shed. I liked learning facts about corn and the corn shucker. The smoke house was next. The outhouse was fun, and we got to sit in it. You had to use newspaper and a corncob to wipe your bottom! Then we went to the museum. We saw an old fashioned town. There was a fun model of the plane that you could lay on and steer. The museum has a model of their camp at Kitty Hawk. Wilbur and Orville did not have very much food and had to write the dates on the eggs to know when they were laid. They slept up top in the barn and could not roll over or they would fall out of their beds to the floor below. Everyone should go see this because it is interesting. I learned a lot.